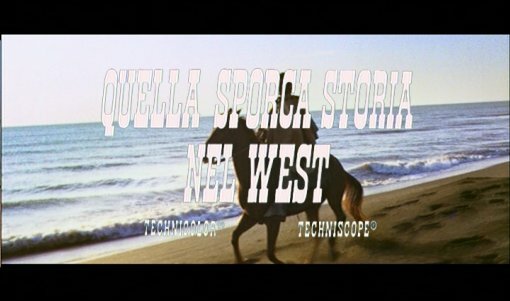 Shakespeare meets the Spaghetti Western in this impressively directed film from Enzo G. Castellari. Koch Media R2 German disc. The Spaghetti Western really kicked off in 1966 when Sergio Corbucci's Django walked into frame for the first time - deliberately challenging the accepted genre conventions, it effectively challenged other directors to twist the genre in their own way, and make the Spaghetti Western more than just an imitation of the American Western. European Cinema has a prospensity for weird film-making, and within the year Giulio Questi's dark and twisted Se sei vivo spara (1967) had been released, followed shortly by the even stranger Death Sentence (1968). In that same year, based on an idea by Sergio Corbucci (probably inspired by Kurosawa's The Bad Sleep Well (1960)) came the strangest adaptation yet, as Western met Shakespeare with gothic horror trappings in Johnny Hamlet. Most of the characters in the screenplay remain faithful to Shakespeare's play, with the lead role taken by Johnny (called Django in the German dub) and the characters of Claudius, Hamlet's mother, Polonius (now a Sheriff) and Horatio all appearing in their usual forms. Rosencrantz (Ross) and Guildenstern (Guild) also turn up, although no mention is made of them being former friends of Johnny/Hamlet's. The female characters are slightly mixed up, with the Ophelia character known as Emily, and a different character called Ophelia. The story itself has plenty twists on the original, the character and storyline revolving around the badit Santana is a new invention, and to keep the film moving there are a number of action scenes added, as henchmen try to kill Johnny and he is ultimately framed for murder. A lot of people die, although not in the same order or manner as in the play, which does mean there are some surprises even for those who know it well. The film has a dark vein of humour running through it, and builds to a good climax. From the opening, red-lit, fog enshrouded dream sequence that looks like something out of a Mario Bava film, it is clear that Johnny Hamlet is not going to be a normal Western. The most impressive set is a candle-lit graveyard in a cave where Johnny first sees his father's grave and the camera loops around his face as he talks to his father's presence. In lieu of a castle, Claudio's house has a suitable gothic ambience with candles and paintings remniscent of Sabata (1969). The only downside of the film are a couple of fist-fights that although well directed, last too long and really drag. Composer Fransecso De Masi (New York Ripper (1982)) gives the film a very fitting soundtrack - from the opening guitar theme 'Find a Man' (that sets words from the play to a modern guitar theme) to some dark, creepy choral themes that give the film a real gothic ambience. Italian actor Andrea Giordana took the lead after a very popular starring role in the Italian mini-series adaptation of another piece of classic literature, The Count of Monte Cristo (1966). He looks very suitable for the role, with some impressive gun handling and good acting. German actor Horst Frank plays the villainous Claudio to perfection with obvious affection for his new wife, but a subtle hint of evil and scheming. The rest of the cast play their parts well, Ignazio Spalla as Guild should be instantly recognisable to fans of the Sabata films, appearing as Sabata's friend in all three of the official films. Like many Spaghetti Westerns, Johnny Hamlet was retitled for the German market and plugged as a Django film - ultimately, with the Hamlet element played down by promoters, the film was seen as just another Spaghetti Western and performed unimpressively at the box office. However, Johnny Hamlet is a very impressive film with a clever script and some fantastic direction, boosted further by a powerful soundtrack and great acting - only the relative lack of action scenes will put some people off this production. One of the best Spaghetti Westerns, Johnny Hamlet is highly recommended to all genre fans. Shakespeare movie collectors might well find this relatively faithful adaptation of interest. Directed by anyone interesting? Enzo G. Castellari - Italian director who cut his teeth on Westerns before moving on action and crime films including Street Law (1974) and Heroin Busters (1976) and returning to the genre to direct Keoma (1976). Any violence? Some gunfights and fistfights, only a little blood. Good soundtrack? A great soundtrack including a catchy title song, and some creepy organ and choir themes. All Spaghetti Western fans should see this one, and might interest Shakespeare fans. The image is very good with strong colours and detail and only a fine layer of grain. Some speckles. Audio Italian and German mono tracks, both sound good. Note: The German track is missing some scenes so Italian track plays here, with subtitle track 2 filling the gaps. Note 2: The German track has a slightly different and inferior musical soundtrack in a few scenes. Subtitles German 1 - translate the Italian track. German 2 - fill in for the missing scenes. English - translates the Italian track. Photo galleries - promotional photos, behind the scenes and promotional material. Manual scrolling. Booklet in the DVD case has brief notes on the film in German only. Packing Single disc digipack in cardboard sleeve. Other regions? Japanese DVD, no English options. A rather unique Spaghetti Western with a clever script, boosted by strong direction and acting. Highly recommended to fans. A great DVD release, print quality is strong and audio is good. The documentary is very interesting. Only the lack of English audio might annoy some. Find our DVD reviews of other Spaghetti Westerns and films starring Horst Frank. All text in this review written by Timothy Young - 31st July. 2006.